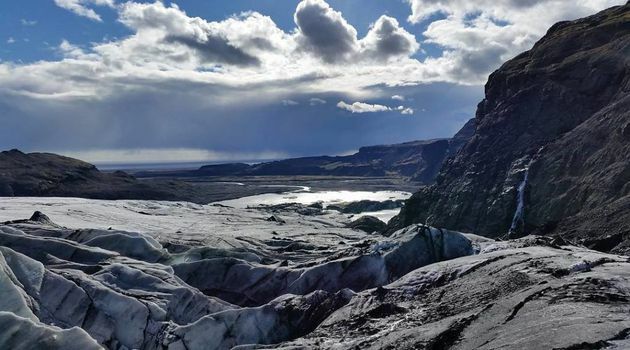 This is a change to discover one of Iceland’s most famous outlet glacier, Sólheimajökull. 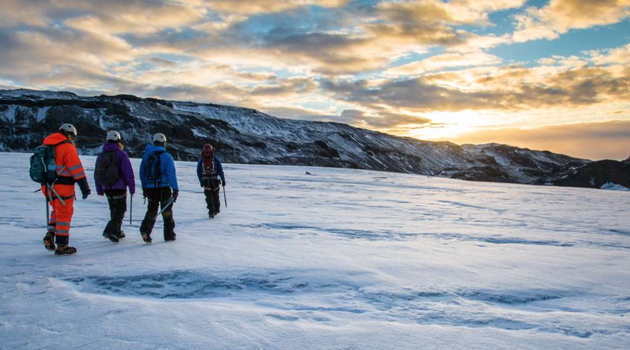 The glacier is located at the South coast of Iceland and we will take you through its spectacular features. We will make our way up the icy but easily accessible slopes, witnessing on the way the incredible ice formations and crevasses. Our experienced mountain guides will teach you how to use basic glacier equipment necessary for this tour. Warm outdoor clothing, waterproof jacket and pants, head-wear, gloves and lunch. Good hiking shoes are recommended! Hvolsvöllur and Hella hotel pick up´s at starts 09:30, for 10:00 departure and 13:30 for our 14:00 departure. Please note that it can take 30 minutes for us to arrive. Reykjavík Hotel pick up´s starts at 08:00, for 10:00 departure. Reykjavík Hotel pick up´s starts at 12:00, for 14:00 departure. Please note that it can take 30 minutes for us to arrive. Selfoss and Vík Hotel pick up´s starts 09:00, for 10:00 departure. Selfoss and Vík Hotel pick up´s starts 13:00, for 14:00 departure Please note that it can take 30 minutes for us to arrive. Have you entered a pick up location? - Yes, meet the guide at Sólheimajökull parking. Road 221 Yes, have already checked a box on the previous page for a location other than Sólheimajökull parking.